Identifying the type of brain tumor helps doctors determine the most appropriate course of treatment. Brain tumor diagnosis usually involves a neurological examination, brain scans, and/or an analysis of the brain tissue. Nowadays, the biopsy, although it is a very invasive procedure, is the most accurate method of obtaining a diagnosis. 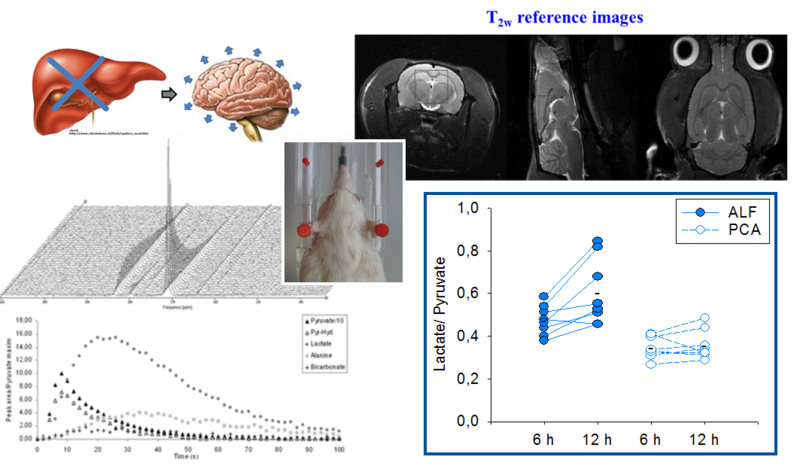 It would be very important to find alternative non-invasive methods which would also provide a reliable diagnosis, and magnetic resonance spectroscopy (MRS) and magnetic resonance spectroscopic imaging (MRSI) may have a significant role to play here as they provide the metabolic profile of these abnormal masses in a non-invasive manner. 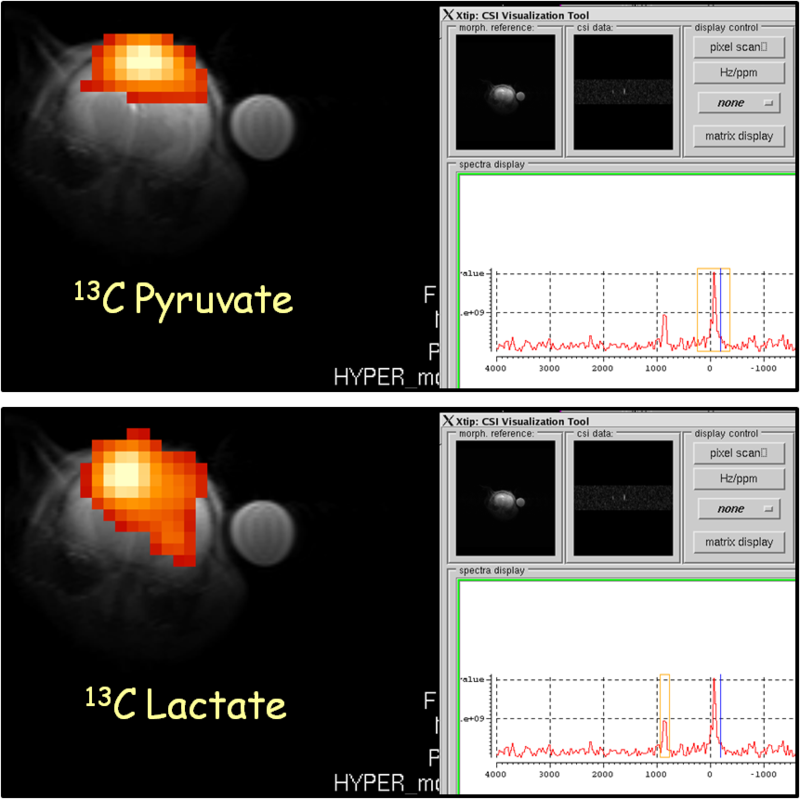 Moreover, the used of contrast agents may further improve tumor classification. 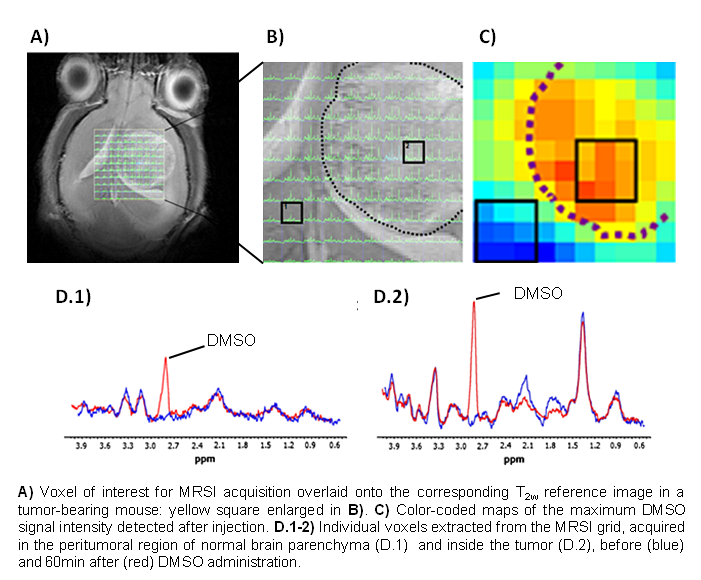 Within this framework, in this study we evaluated DMSO as a potential contrast agent for detecting brain tumors. DMSO was administrated to normal and tumor-bearing mice and they were investigated by MRS and MRSI. 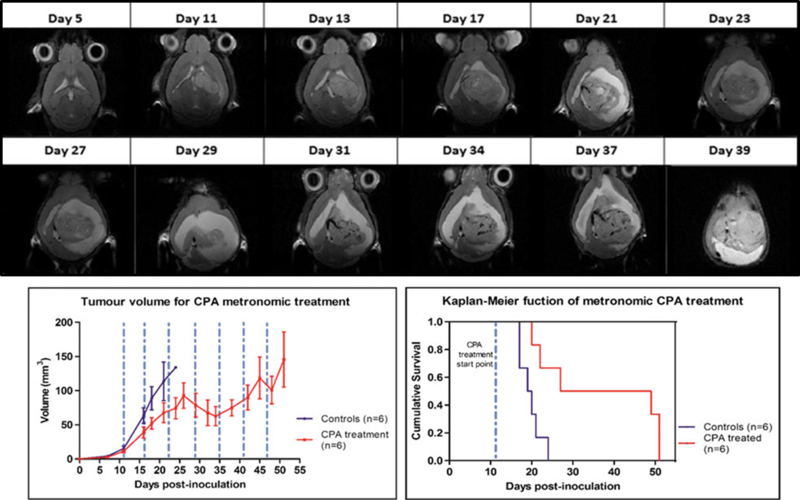 Differential DMSO accumulation and wash-out kinetics were observed in normal versus tumor-afflicted brain parenchyma. 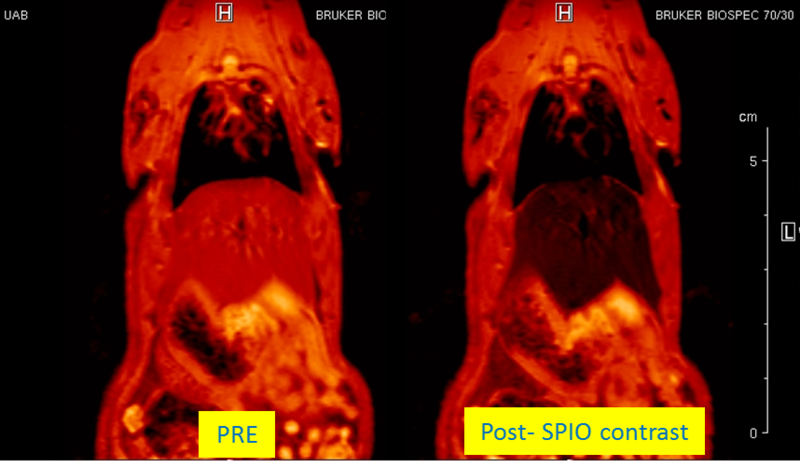 MRSI maps of time-course DMSO changes revealed clear hot-spots of differential spatial accumulation even in tumors that did not enhance in T1w-images post gadolinium injection. 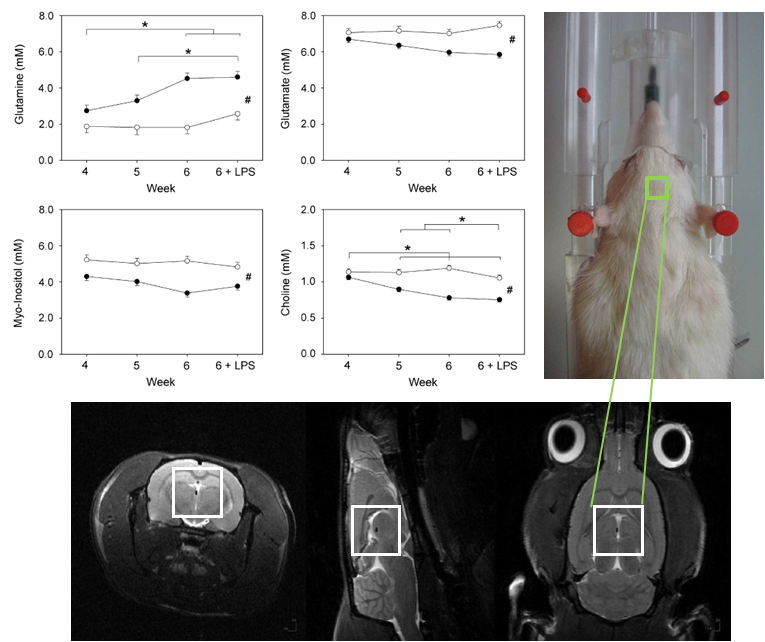 Our results indicate a potential role for DMSO as a contrast agent for brain tumor detection, and possibly for monitoring their heterogeneities, for example due to progression or to therapy response. © 2012, Silvia. All rights reserved by the author(s) and Universitat Autonoma de Barcelona except for texts and images already copyrighted by third parties (e.g. journal publishers) and used here under the fair use provision.